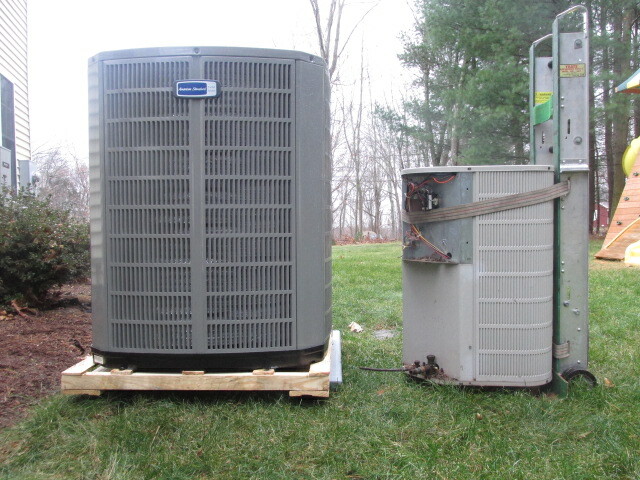 This larger outdoor unit is a 16 SEER (seasonal energy efficiency rating) and the smaller one is a 10 SEER. The 10 SEER was straight cooling and used R-22 refrigerant, which has been phased out. The new 16 SEER uses an alternative R-410a refrigerant. The new one is an air source heat pump. This will heat the house until the temperature gets too cold outside and then it will shut off and the oil fired furnace will cycle on. Its cooling capacity is the same as the older one however it is larger because it requires more surface area of coil to obtain that higher efficiency rating. It also has a multi-speed compressor. The compressor runs at one speed on hot days, and faster on hot humid days.